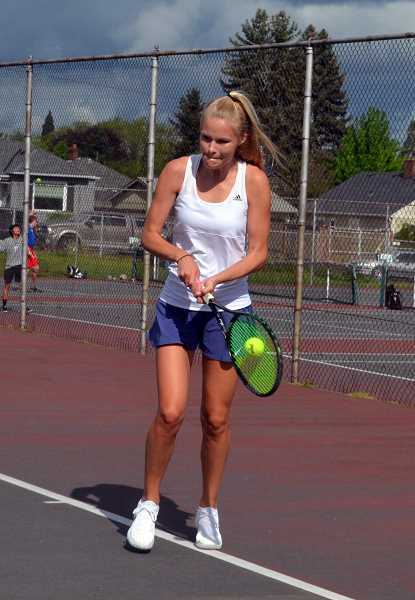 The girls tennis season is upon us, and the team has a new coach at the helm. Well, kind of. Kirk Fowler coached the team from 1998 to 2005, and has returned to take the reins from coach Steven Huynh, and to hear him say it, it's good to be back hunting for a title. "This has always been a great group of athletes to coach — talented, athletic, mentally tough and excellent in the classroom," Fowler said. "During my last tenure we had state champions and runners-up, and won three state titles, but in tennis that often comes down to two or three really strong singles/doubles teams." While the league has changed a little since 2005 and the landscape is an unknown for the new-old coach, what is a certainty is the quality of players and the leadership of the team. Fowler knows his team is good, and wanted to get them to prove how good in tryouts. "I wanted to look at our athletes with no bias as we headed into tryouts," Fowler said. "I do know Madeleine Klein went to state last year in doubles and Elle Berry went in singles. I believe thatÚ»s all returning from last year. I'm not one for highlighting individuals before we play, but I will say we have 11 seniors with a lot of solid players and leadership." Among those strong returners are Berry and Klein, as well as Izzy Gonzales, Anna Sweetland, Honour Colby, Sophie Helig, Gracie Killelea, and Grace Love. With the team so top heavy, the influx of younger players (five juniors, three sophomores and one freshman) is important for the future of the team. While the team had trouble practicing early on with cold weather and rain, things have picked up. With the season gaining steam, Fowler has adopted the improvement mind-set ahead of seeking victories, wanting his players to be the best they can be. "What I'm really looking forward to this year is just working with the girls, watching them compete and improve," Fowler said. "Wins and losses, titles, etcetera, is something I'm not thinking about right now. I'm still trying to get to know our players. We will go out to compete in every match. The goal is to win, but it is not the top priority."